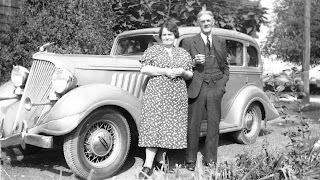 We’ve already met Alodia Howard Schleifer, one of the women who signed the quilt, in connection with her husband Fred’s purchase of a Hudson Terraplane from a car dealership on South LaSalle Street, next door to the Odd Fellows Hall. (See the posting for July 16, 2009.) Since July I have found this photo of the happy couple standing in front of the car in question. FYI: The crease on the front left fender is a flaw in the photo, not the car. But the car did not figure in my childhood memories of Alodia Schleifer. Actually, I don’t remember knowing her because she moved to Utah when I was only three or four years old. My memory consists of the oft-repeated story of how she was healed from terrible burns when my grandfather Greer administered to her in the late 1930s. Recounting that terrible night when Alodia Schleifer needed a blessing, Jim said: “Fred Schleifer worked at Lyon Metal in the same department with me, and I introduced him to his [second] wife. She was making jelly, and she had a big stew pan full of jelly. It was just about ready to jell and she poured a little bit out into a glass of cold water to see if it was hard enough to ball up. She spilled some on the floor and she didn’t take the time to wipe it off the floor. When she stepped in this jelly, she hit the stew pan and it turned on her in the face and on her left shoulder. [It burned her so badly that her] head didn’t look like a woman’s head at all. It was almost half as big as a nail keg. Big water blisters with great big bags of water were all over her. She didn’t look human. Alodia’s children were still living at Mooseheart and learned about the accident the next time they saw their mother. Georgia agrees with the Greers’ version of the incident. 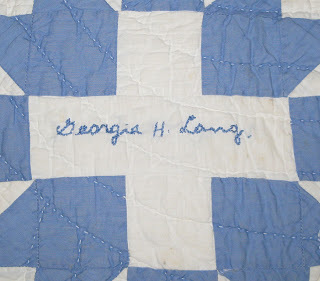 Alodia and her daughter Georgia H. Lang both signed the quilt, although they must have sent their signatures back from Utah to be included. I have spoken with Georgia and she does not remember ever seeing the quilt. 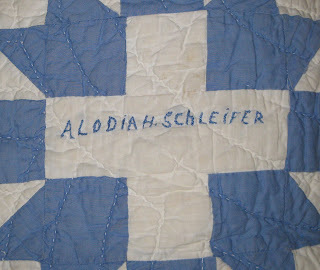 Since her signature shows her married name, it dates the quilt after June 1948. Georgia was named for her father, George Howard. He worked in the coalmines in Carbon County, Utah, and was a superintendent when he passed away on March 16, 1936. He did not die in a mine explosion as we had erroneously thought, but caught a “cold,” that turned out to be spinal meningitis. Fred Schleifer went west with them but Utah didn’t exactly suit him. Before long he moved back home where he married “the lady who ran the grocery store.” Meanwhile, Georgia met Ray Lang at the LDS Business College in Salt Lake City and they were married on her nineteenth birthday, June 8, 1948. Alodia passed away on September 13, 1956.